Yep... it's back to work and back to risking the wrath of the security guards at Canary Wharf as I bring you another night shot from the Wharf.. Seems they've been busy since my last visit putting up lights and trees all around the estate. Looks quite nice actually and reminds me I must go up to Oxford St/Regent St one night to see the lights. Was cold today... No snow unlike much of the UK and Scotland but flippin cold. Apparently snow is due tonight/tomorrow. This is AMAZING! love it love it love it! Fantastic. 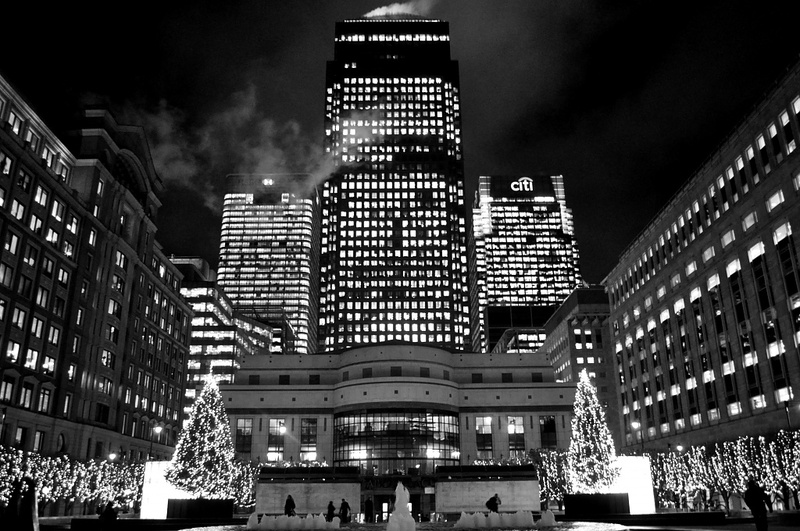 It looks like Gotham City in B&W! Love it. Oh very very nice. Agree with shelly! very cool angle and perspective! Nice shot Andy. You are pushing your like hanging around that place. this is a fave, i am hopeing to go to London next year for a week, and i am def going to the warf, these pics are so inspiring. Ah the B&W is just fantastic! Wonderful shot! So beautiful!! Love the processing!! Fabulous B&W. Your photos are very diversified & intriguing. Lovely shot. Glad you weren't harassed tonight. Worth the risk! Nice shot and love the editing you have done. Wow! Really neat shot! Funny that black and white must just feel "cold". I took a shot outside in the frigid air and immediately thought of taking out the color to convey the temp. Ha! Boy, and I just can't believe that there's so much snow over the pond, when we still have yet to get any to stick to the ground.